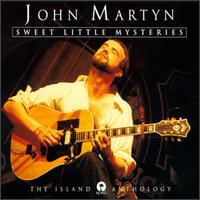 Sweet Little Mysteries is Island's anthology of John Martyn's career. All of his most famous cuts are here, along with many overlooked treasures. Touching on most phases of Martyn's career, only his earliest works and his stuff on Atlantic are not included here. A very well-put-together overview of one of Britain's finest exports of the folk/jazz/rock mold. Released on 6th June 1994. An excellent overview of John's music with Island, which spans the greater part of his career. Noticeable by their absence are any songs from John's first four albums - a little strange ! Surely there was room for Parcels, Cocain, Dusty etc - apparently not. A well put together package and an excellent introduction to John's music.